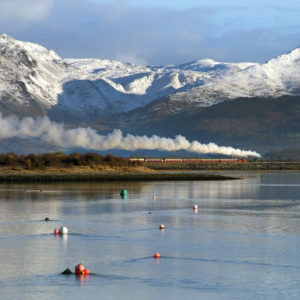 The Welsh Highland Heritage Railway, Porthmadog, is a small railway catering for all ages, in all weathers, and whatever your level of interest, there is something to offer you. Trains are operated by either historic steam locomotives or vintage diesels, with traditional wooden carriages. The aim is to recreate the atmosphere of the old Welsh Highland Railway of the 1920s. 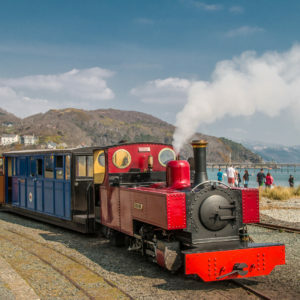 The train ride is a short journey from Porthmadog to Pen y Mount where the younger passengers are invited to assist the guard in operating the points and signals while the locomotive runs round the train. 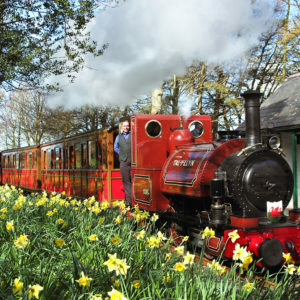 On the return journey, the train stops at Gelert’s Farm, where passengers are invited to take a ride on the miniature railway and to visit the award-winning museum. The railway is situated in Porthmadog, just across the road from the main line rail station and level crossing, opposite the Queens Hotel, with free car parking. Learn about the History of Porthmadog and its trade in slate, shipping and ship building, and the narrow-gauge railways and ancillary trades that served these industries. Learn about the Personalities responsible for its development. Learn about the earliest railways in Porthmadog, in the days before steam locomotives. Learn something about the complex story of the Welsh Highland Railway and its predecessors. Learn about the wider use of narrow-gauge railways worldwide. View the collection of locomotives and carriages, which includes several major artefacts from the original Welsh Highland Railway of 1922. The train crew are very happy to answer all your questions! After about half an hour, the train will return to Porthmadog. If you fancy repeating the experience, tickets are valid all day. Take the opportunity to have a bite to eat and a drink in the Russell Tearoom, and to browse the souvenir, book and model shop. Porthmadog mainline rail station is served by trains on the highly scenic Cambrian Coast Line from Birmingham, Shrewsbury, Machynlleth, Barmouth & Pwllheli. The nearest bus stops are close to the main line rail station and are served by local, Snowdon Sherpa and TrawsCymru buses, connecting additionally with Caernarfon, Blaenau Ffestiniog, Beddgelert, Bangor and Aberystwyth. We’re on the A4871, Sat Nav LL49 9HT. From Caernarfon, Beddgelert or anywhere north head for Porthmadog. As you arrive in town, the railway is immediately left before the level crossing. If you go past Tesco, you’ve gone too far. From Criccieth, Pwllheli, Black Rock Sands and Greenacres Holiday Park turn left into the High Street, past Tesco, and the railway is on the right just past the level crossing. From Dolgellau and the south follow the A487 along the Porthmadog Bypass towards Pwllheli, then follow the Bypass to the first roundabout. Turn left towards Porthmadog town centre, and the railway is on the left immediately before the level crossing. There is a free car park for customers, but it can get busy. A long stay pay-and-display car park is just across the road.